Have you heard the latest? Our flavored breads appear to be a hit. 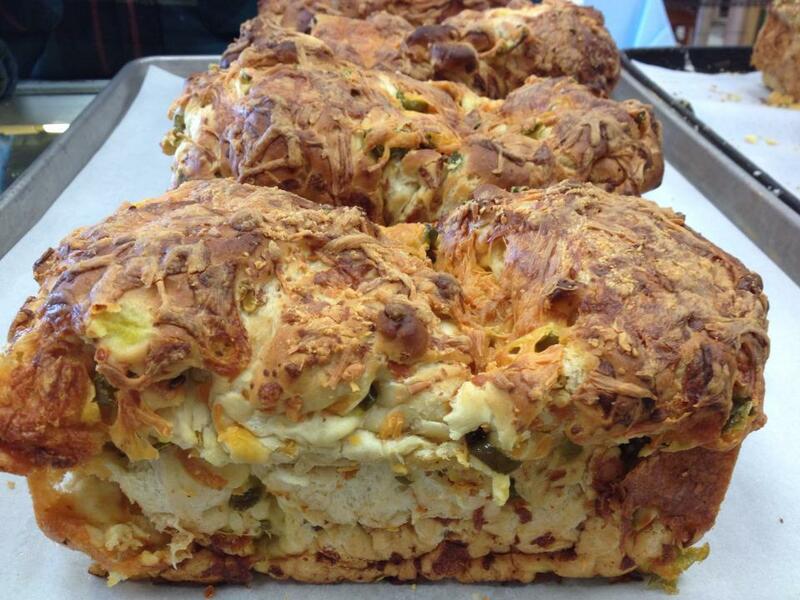 One of our Facebook fans recently gushed over our breads, saying they were “great flavors and so fresh! The best I’ve ever had, and I have eaten my fair share of flavored breads.” A few days later, she returned with the news that our jalapeño cheese bread is “yum, yummy.” We’re so grateful to receive such great feedback, which inspired today’s post on jalapeño cheese bread. Poached Egg on a slice of jalapeño bread. Jamie Oliver recommends pairing jalapeño bread with jerk chicken. See how to make his jerk chicken here. Blogger Moozoo Cooks put forth as a contender for "the best sandwich in the world" her variation on the grilled cheese sandwich using sliced green apples and, of course, jalapeño cheese bread. We're not surprised that jalapeño cheese bread seems to inspire recipes with such lush titles. Just look at the picture of our jalapeño cheese loafs above and you can guess (if you haven't had a chance to try them yet) just how rich they taste. As you can see, you can get as creative as you like when creating a meal out of them. Or, as we said before, just enjoy the bread as is. Remember, we also have other breads to choose from, including rosemary olive oil and garlic cheese. All for just $2.99 each, a bargain compared to what’s on most grocery store shelves these days, so you can’t lose. Let us know if you have any recommendations on how you like to eat any of our breads, alone or with a special meal. Just post a comment here on this post or on our Facebook page. We’d love to hear your ideas.